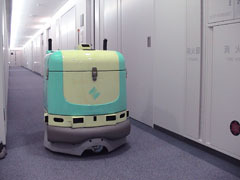 GRAND PRIZE: Robotic building cleaning system (Fuji Heavy Industries and Sumitomo). The system received high marks for its efficiency and its ability to work both independently and alongside humans. The judges believe the robot has great potential to develop the market for robotic cleaning systems, as well as establish new business models in which robots and humans work side by side to provide inexpensive cleaning services. SMALL-TO MEDIUM-SIZED VENTURE PRIZE: KHR-2HV (Kondo). The judges gave high marks to KHR-2HV for its relatively low price tag and its popularity with individual users both young and old. 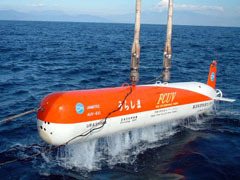 KHR-2HV was also recognized for fostering closer ties between humans and robots, as well as for its educational value. HONORABLE MENTION: My Spoon (SECOM). The judges awarded their special prize to My Spoon for its contributions to society. 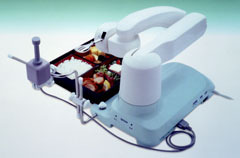 The robot has received praise both in Japan and overseas for helping people enjoy the meals they want to eat and enabling them to eat with friends and family. The judges recognized the high quality of My Spoon resulting from SECOM's close cooperation with users and medical professionals in the development phase. 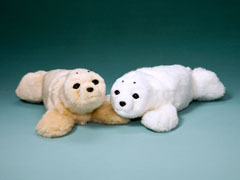 They also like it because it is affordable. Japan's Ministry of Economy, Trade and Industry (METI) has announced its top ten list of finalists for the 2006 Robot Award. The ten robots selected from 152 applications fall into four categories -- service robots, industrial robots, public sector robots, and small- to medium-sized venture robots. METI established the annual Robot Award this year to recognize outstanding developments in the field of robotics, encourage further research and development, and stimulate demand. Winners of the grand prize and the special prize for small- to medium-sized ventures will be announced on December 21. These industrial robot arms are capable of human-like movement, which is great news for factories worried about Japan's shrinking population (and human labor force). The DIA10 consists of two 7-axis arms mounted on a torso. According to this spec sheet (PDF), the robot has the "finesse of the human arm without the physical limitations." The same 7-axis design is incorporated into the IA20, a "snake" robot with great freedom of movement and the ability to operate in tight spaces. 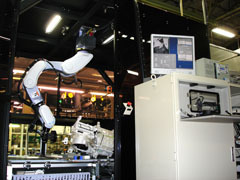 This robot relies on advanced machine vision technology to perform automated inspections on the go. Highly reliable inspections can be performed at each location without stopping the line, allowing for speedier and more cost-effective operations. These remote-control unmanned construction machines were originally developed for dangerous recovery operations following disasters such as avalanches and rockslides. KHR-2HV is a high-performance build-it-yourself biped humanoid robot kit. The popular KHR-2HV is faster, lighter and more agile than its predecessor, KHR-1, and it is packed with more controls, gears, servos and software. 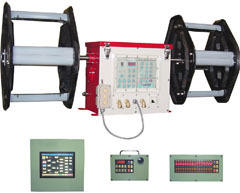 Towa Denki has made a number of improvements to its automated squid-fishing machines since the company began manufacturing them in the 1970s. She missed the application deadline. Look for her at next year's award ceremony. Hello from America and New Hampshire!!! Great job!!! I want to make snake robot. Can u please send me some important data?so from that i can start my work.